Home / Food and Drink / Desserts / This Is Not A Drill: You Can Now Buy Gin & Tonic Easter Eggs! Chocolate and booze lovers of the land listen up: your chocolate-gin dreams have come true thanks to the greatest booze-food hybrid to bless us with its presence. Enter: the gin and tonic easter egg i.e. the only egg you'll be begging your parents/boyfriend/yourself to buy you this Easter. First we were gifted wine-inspired make up, then came wine handbags and last Christmas alcoholic baubles were the cherry on the cake, but for gin lovers among us this could be the most exciting alcohol hybrid yet. Allow us to introduce you to gin & tonic easter eggs. Yes, you read that right. We're already counting down the days until Easter, otherwise known as the only time of year it's totally okay to gorge ourselves on cocoa until we're nursing an egg-shaped food baby and can't move. But just when you thought you couldn't possibly get any more excited for this Spring holiday (hello four-day weekend), a boozy chocolate egg has been bought into our lives because it's not all about lambs and daffodils. 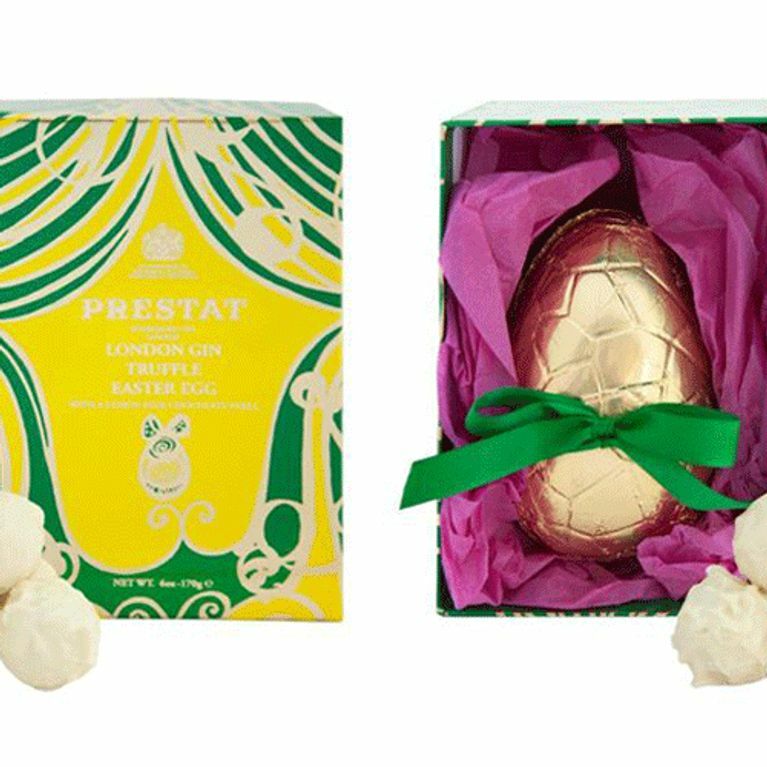 This gin-tastic chocolate gift is all thanks to the foodie nerds at Prestat, whose G&T eggs are available at online supermarket Ocado. Retailing at £16.99 each, it may be above the standard easter-egg budget you allow yourself but did we mention GIN? The beautifully boozy treat is described as a 'lemon chocolate shell' with 'London gin truffles' hidden inside, making it worth every of the 1600-plus pennies. Although the alcohol content is obviously much lower than your go-to gin in a tin, this makes for a much more socially appropriate way to get your gin fix when catching up with the relatives. Plus, it's guaranteed to make your drunk uncle 100 per cent more bearable. No longer can your beloved G&T be described as empty calories as this egg is almost half of your daily allowance but hey, it's Easter - calories definitely count on such special occasions. Will you be getting your mitts on a gin & tonic easter egg? Let us know @SoFeminineUK!